In a rare election-day political campaign event, Gubernatorial Candidate Greg Abbott was met by a large group of workers, business leaders and political activists as he unveiled his "Working Plan for Texas" in Houston at Mach Industrial Group. Abbott's plan includes five points for applying sound fiscally conservative principles to controlling the size and growth of Texas government in order to maintain and expand the rich economic opportunities in this great state. Attorney General Abbott was introduced to the crowd by Mach's President & CEO, Steve Mach. After the speech to the crowd, Abbott spoke briefly with the local television stations that were present to cover the event (Fox 26 and Univision). He then sat down with me for a one-on-one interview to discuss his plan and a couple of other issues. I thought it was interesting that Abbott chose this location to roll out this program in Houston. Abbott explained, "[T]his is one of the job creators in the great state. These are the men and women who go to work everyday to earn a paycheck. My goal as governor is to make sure that the workers at this plant, the owners of this plant, the entrepreneurs are going to be able to earn more and keep more of what they make. We do that by making sure that we have the right size government. We have a government that doesn't dig too deeply into their pockets, doesn't take too much of the tax money, and protects against growing government that will impose more burdens on them." 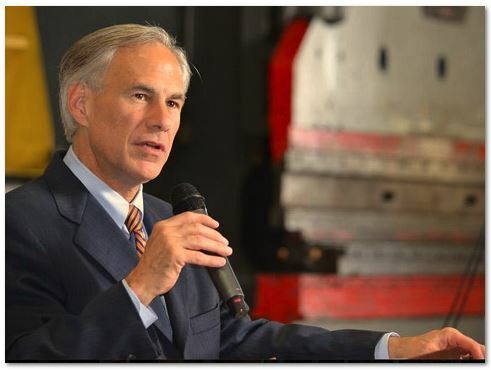 Opportunities are certainly plentiful in Texas after twenty years of Republican control of statewide offices, a tradition Abbott certainly plans on continuing next fall. But with all the opportunity comes a huge increase in population for the state and a corresponding increase in demand for state infrastructure resources including transportation and water. I asked Abbott how he would address these challenges while helping the state to grow in a fiscally responsible manner. "It's very easy," he explained, "if you follow my plan for both spending and for a constitutional amendment because what I call for is a more strict standard for spending but also a standard that is loose enough that it makes up for the growth and the population. My standard is to allow the budge to expand no more than the increase in the size of population growth plus inflation. That allows us to accommodate for the increased demands on roads or schools, water, etc as the state grows, but puts limits on the amounts that government can spend." Our readers at TexasGOPVote have expressed concern about some in the state government who seem quite eager to tap into our state's Rainy Day fund. I asked Gen. Abbott about if he would be eager to dip into this safeguard of our public financing system. "Not at all," he responded. "The Rainy Day Fund is our savings account. We need that Rainy Day Fund. Remember this, a lot of people forget this fact, and that is over the past 10 years, twice we've run budget deficits we needed to tap into the Rainy Day Fund for, or tap into reserves. We need this to ensure that we're going to be able to balance our budget. So first and foremost, we need to keep a certain minimum balance in our Rainy Day Fund." "Secondly," he continued, "we need to put additional protections so we stop the Legislature from tapping into the Rainy Day Fund for ongoing core government expenses. That's why part of my plan is to put new Constitutional limitations on the reasons that will allow the Legislature to tap into the Rainy Day Fund." Budget surpluses are often a massive temptation to those in Austin with their eyes on the people's checkbook. Abbott explained that he felt surpluses should not be spent, but rather, used to pay down our state's huge debt or that it should be returned to the taxpayers in the form of tax relief. More details for the General's plan for the Texas economy can be found in this article on his campaign's website. I switched gears to discuss our state's border security problem with our souther border and the failure of the federal government to secure this border. While this is a federal responsibility, the governor of Texas has the ultimate responsibility for the safety of the people of Texas. "We've tried several legal angles to get the federal government to do its job," Abbott stated. "There was a lawsuit back when Bush was governor called Bush vs. the United States. They sued the federal government to make the federal government pay us for all these costs we incurred: imprisonment costs, education costs, healthcare costs. The federal court said that that was a political issue that the courts would not decide. More recently of course, there was the lawsuit that was spearheaded by the state of Arizona. Where the United States Supreme Court tied the hands of the state. So that's the long way of explaining the options available to the state are limited." "So what we have to do is we have to, as state leadership," Abbott continued, "is step up and do the job that the federal government has failed to do, even if it means incurring more costs to taxpayers. One of the things that I will do as governor is make sure that we secure our border. The reality is, we are here in Houston today. Houston is one of the most dangerous places for cartel and gang-related activity because the cartels are coming to Houston, they're leveraging gangs here to distribute their drug products, and we need to be able to crack down on them to keep people here in Houston safe, but at the same time, work to protect on the border itself, so one thing I will do as governor is work to secure our border, even if it means we as Texans have to pick up that tab." Lt. Governor David Dewhurst recently said that Texas should seek reimbursement from the federal government for our costs associated with the federal government's failure to exercise its responsibility. I asked Gen. Abbott if this is a way to do this. "We have explored legally the way to recoup the money from the federal government," Abbott responded, "and the courts have said no, we can't do that. We have to put pressure on the federal government to reimburse us, and I can do that, will do that, as a voice to convince Washington to take the bill that they're imposing on us, but Obama may not do that for us, and the Democrats in Washington may not do that for us, and so if they fail to do that, we're going to have to find our own Texas-based solutions to solve these problems." General Abbott has committed to come back to TexasGOPVote.com to talk to our readers about other specific programs and issues related to his campaign to be the next governor of Texas and to help all of our Republican candidates keep Texas RED! He said, "You can count on it!" Political Analyst and Blogger Bob Price: We're here at Mach Industries today with Texas Attorney General Greg Abbott. General, welcome back to TexasGOPVote. Attorney General Greg Abbott: Thank you so much. Great to be back with you again. Bob Price: Today you picked out a perfect backdrop to roll out your working for Texas business plan on how to move the state of Texas forward in the business economy. Tell us a little bit about that. Bob Price: So, one of the things that I'm interested in, we're growing very rapidly as a state, how do we grow the infrastructure of the state and still maintain fiscal responsibility? AG Greg Abbott: It's very easy if you follow my plan for both spending and for a constitutional amendment because what I call for is a more strict standard for spending but also a standard that is loose enough that it makes up for the growth and the population. My standard is to allow the budge tot expand no more than the increase in the size of population growth plus inflation. That allows us to accommodate for the increased demands on roads or schools, water, etc as the state grows, but puts limits on the amounts that government can spend. Bob Price: There's been a lot of pressure, particularly in this last session, on the Rainy Day Fund. Is that something that we can just dip into at will, or how do we work with the Rainy Day Fund? AG Greg Abbott: Not at all. The Rainy Day Fund is our savings account. We need that Rainy Day Fund. Remember this, a lot of people forget this fact, and that is over the past 10 years, twice we've run budget deficits we needed to tap into the Rainy Day Fund for, or tap into reserves. We need this to ensure that we're going to be able to balance our budget. So first and foremost, we need to keep a certain minimum balance in our Rainy Day Fund. Secondly, we need to put additional protections so we stop the Legislature from tapping into the Rainy Day Fund for ongoing core government expenses. That's why part of my plan is to put new Constitutional limitations on the reasons that will allow the Legislature to tap into the Rainy Day Fund. Bob Price: And then if we have a surplus in the budget, what do we do with that? Is that a tax rebate or tax reduction? AG Greg Abbott: You can use it to pay off debt, which listen, the state of Texas is higher in debt than what people realize, or it can be used to return to the taxpayers in a form of tax relief. Bob Price: Changing subjects just a little bit: border security. What do we do to get the federal government to do its job, and if it won't do its job, what do we do here as Texans to protect our border and citizens? AG Greg Abbott: We've tried several legal angles to get the federal government to do its job. There was a lawsuit back when Bush was governor called Bush vs. the United States. They sued the federal government to make the federal government pay us for all these costs we incurred: imprisonment costs, education costs, healthcare costs. The federal court said that that was a political issue that the courts would not decide. More recently of course, there was the lawsuit that was spearheaded by the state of Arizona. Where the United States Supreme Court tied the hands of the state. So that's the long way of explaining the options available to the state are limited. So what we have to do is we have to, as state leadership, step up and do the job that the federal government has failed to do, even if it means incurring more costs to taxpayers. One of the things that I will do as governor is make sure that we secure our border. The reality is, we are here in Houston today. Houston is one of the most dangerous places for cartel and gang-related activity because the cartels are coming to Houston, they're leveraging gangs here to distribute their drug products, and we need to be able to crack down on them to keep people here in Houston safe, but at the same time, work to protect on the border itself, so one thing I will do as governor is work to secure our border, even if it means we as Texans have to pick up that tab. Bob Price: Is there a way to recoup this money from the federal government? AG Greg Abbott: We have explored legally the way to recoup the money from the federal government, and the courts have said no, we can't do that. We have to put pressure on the federal government to reimburse us, and I can do that, will do that, as a voice to convince Washington to take the bill that they're imposing on us, but Obama may not do that for us, and the Democrats in Washington may not do that for us, and so if they fail to do that, we're going to have to find our own Texas-based solutions to solve these problems. Bob Price: We do have a long way to go on this issue and hopefully Washington will come around and do its job, but in the meantime, we need someone there that will take care of the state of Texas to make sure we're safe. AG Greg Abbott: That's exactly what I will be doing. Bob Price: Well Attorney General, thank you so much for coming here to talk to TexasGOPVote again, and we hope we can sit down again with you in the future and talk about a couple other issues. AG Greg Abbott: You can count on it!